The general terms and conditions of the L’Occitane web shop have been drawn up in accordance with the Consumers Protection Act (ZVPot-UPB2). 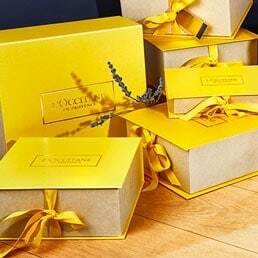 The L’Occitane web shop (hereinafter referred to as “web shop”) is managed by Stillmark d.o.o., the provider of e-business services (hereinafter referred to as “the provider”). Be sure to read the general terms and conditions of this online store carefully since you are bound by them from the moment you enter our online store. With every transaction made in this web shop, it is considered that you have been acquainted with the entire content of general terms and conditions, and that you have accepted the general terms and conditions without exceptions. The services of this web shop can be used once you become a registered customer. To register into the system, you need to acquire a username that is the same as your e-mail address, and then choose a password. The username and the password define the user unambiguously and associate the user with the information entered. By registering, a visitor older than 18 years old becomes a customer and acquires the right to make a purchase. The provider reserves the right to change the general terms and conditions without prior notification. The changes become valid upon publication and are binding upon the customer. To review what is available to purchase simply browse the online product catalogue. When you have arrived at the item you wish to order, click on "Add To Bag" and then decide your requested quantity. When your order contains the item quantities you wish to purchase, please login to continue to the next step or register if it is the first time to make a purchase online. You will then be asked to provide us with your shipping and payment (credit card) information. Double check your purchase and confirm your order in the final step. Add your selected product to the shopping bag by clicking the appropriate icon (»Add to bag«). Products are arranged into categories (e.g. by ingredient, fragrance, purpose of use etc.) and can be found by the search engine as well. For more information on the selected product, click on the image, the name of the product or the “MORE...” tab. You can add an unlimited number of products to your shopping bag. When you finish adding products, you can either resume shopping later on or go to checkout. If you choose the first option, products will remain in the shopping bag to be purchased later. Products in the shopping bag can be removed if necessary (click [X] or change the quantity). If you would like to add free complimentary product samples to your selected products, please click the “Gift wrapping and free samples” banner. You can add up to three different samples. By clicking “Continue shopping”, the samples will be automatically added to your shopping bag. If you are a registered user, enter your username and password in appropriate fields. If you are a new customer, please click “New customer” and fill out the “My details” form. All fields marked with an asterisk (*) are mandatory. Confirm your details by clicking the “Continue shopping” button. The shipping address is filled in automatically and is the same as the billing address you have entered into the “My details” form. If you wish to receive your purchased items to an alternate address (e.g. at work) or send them as a gift, click “Shipping to alternate address” and enter the information required. Thus, the invoice will be sent to the customer whereas the purchased items will be shipped to the addressee. Remember, if you wish to send the purchased items to an alternate address, payment on delivery is not possible. By clicking the “Continue shopping” button, you will proceed to a page where you will have to select a form of payment. Before you click the “Confirm purchase” button to place your order, check the list of your purchased items and make sure it is correct. Check the shipping address as well. If your purchased items are a gift, you can click the “Edit” button in this step and enter a personal message which will be added to the products when shipped. Please select a payment method and click “Complete purchase”. Enter the required information and complete/confirm your purchase by clicking the “Buy” button. An order confirmation will be sent to your e-mail address. Once you have paid via credit card your order will be immediately processed online. Once your credit card details are verified by Activa Payment Gateway, we will pack your order and deliver it to you. Note: When you click the “BUY” button and confirm the data you entered, your card is not charged for the purchase amount yet. Details will be verified and your expenses will be reserved. When we receive a signed delivery note confirming the delivery of shipment, we will make a transaction for the purchase amount (the amount charged can be either equal to or smaller than the authorised amount, e.g. if upon prior notification, we have sent you only some of the items ordered). For your protection, the Activa Payment Gateway system does not allow charging your card for an amount exceeding the purchase amount. In addition, your credit/debit card number is not visible for security reasons. The provider can only see the transaction number which is sent for payment or cancellation of payment if for any reasons, the payment cannot be made. The Activa Payment Gateway system will automatically send you an e-mail containing all the necessary information on the course of payment or its cancellation. All prices on this site are processed in EUR and include VAT (value-added tax). Product prices listed are current, however they are subject to change without advance notice. The provider is committed to protecting your privacy. All personal information of the web shop customers is confidential and shall in no case be disclosed to any unauthorised parties. If you turn off cookies on your computer, you will not be able to complete a purchase on the website. In order to complete a purchase on the website, you will need to provide us with your personal information. However, none of the information that you provide to us is disclosed to any third party other than for the purposes of credit card purchase validation, fulfillment for order delivery, marketing and promotion. We have taken all measures that are necessary to keep this personal information confidential. You can review, change or request deletion of your personal information or unsubscribe newsletter. If you wish to unsubscribe the newsletter, please send an email to e.trgovina@stillmark.si. Protection of personal data is a responsibility of the customers who should provide secure username and password and install adequate software (antivirus) protection on their computers. Under Article 43 of the Consumers Protection Act, the customer may send the provider a written notification of withdrawal from the contract or order within 8 days after having received the purchased items. The notification should be sent to the e-mail address e.trgovina@stillmark.si. Items can be either returned by post at the cost of the customer or personally to the store L’Occitane - Bled. The provider shall make a full refund of the purchase amount as soon as possible and within 15 days from having received the notification of the withdrawal from contract Refunds are made to the customer’s bank account. All purchased products are fully examined prior to delivery and shipped in undamaged condition. Your products will be carefully packed into a carton box so that you receive them undamaged and in original packaging. In case of damaged goods, the customers have the right under Article 37 of the Consumers Protection Act to demand the defective product to be replaced by a new flawless item or to receive a refund for the amount of purchase or to eliminate the damage or to refund partial amount of payment in proportion to the damage. In case of damaged packaging, the customers have to inform Stillmark d.o.o. of their requirements within 8 days from receiving the purchased items. Items purchased in the web shop will be replaced with items from one of the L’Occitane boutiques throughout Slovenia. The products have to be returned unopened, unused, undamaged, in the same quantity and in original packaging. The products can be replaced within 8 days from their receipt. Replacement is possible only if the original receipt or its copy are attached. Orders can be made online 24 hours a day, every day. Orders received from Monday to Friday until 4 pm will be shipped on the same day. Shipment and delivery will take max 2 days (shipping day + 2 days). Orders received on Saturdays, Sundays or on public holidays will be shipped on the first workday that follows. Our contracting party for shipment delivery is the Post of Slovenia. The customer is obliged to cover the postal charges if the purchase amount is less than € 45. If the purchase amount exceeds € 45, the delivery is FREE OF CHARGE. Delivery expenses fixed at € 3,00 shall be registered in your order and receipt that will be enclosed with your purchased items. If you choose payment on delivery, € 1,62 will be added to your postal charges due to the commission charged by the Post of Slovenia. Delivery expenses are charged according to the currently valid price list of the Post of Slovenia. Items purchased from this web shop can be delivered to any address within the territory the of Republic of Slovenia. If you wish to order our products in Slovenia but ship them outside the territory of the Republic of Slovenia, please visit our worldwide website: www.loccitane.com. If the product you wished to purchase is unexpectedly out of stock, you will be contacted and asked whether you wish to cancel or partly cancel your order or else wait until the product is in stock again. Please accept our apology for any inconvenience that might have been caused by this situation. L'OCCITANE does not accept back orders. Shopping and payments in this web shop are safe. All transactions at this online store are protected by Secure Sockets Layer (SSL) and Secure Data Encryption using a 1024-bit process. All credit card payments are processed in real-time for your security and immediate peace of mind and details are immediately checked with the relevant bank. Payments can be made with credit cards (Maestro, Activa Maestro, MasterCard, Visa, Visa Electron, Diners Club). Any information that you send to us is encoded with SSL encryption technology. This sophisticated encryption process ensures that prying eyes are unable to decode your personal data when it travels from your computer to ours, and from our computer to the bank's. Encrypted personal details are transferred from your computer to the bank’s authorisation server without being saved on the provider’s server. You can tell whether your browser is in secure mode in the checkout by looking for the padlock icon in the bottom corner or at the end of the address bar of your browser window. Safe authorisations and credit/debit card transactions are provided by the Activa Payment Gateway system. To the best of his ability, the provider's aim is to guarantee that the information on this website are accurate and regularly updated. However, product characteristics, delivery period or price may change so quickly that the provider does not manage to update the information on this website. In such cases, the provider shall notify the customer of the changes, whereas the customer will have to right to cancel the order or exchange the item purchased. Although the provider makes sure to present accurate images of the products available for purchase, these images should be considered symbolic. The provider reserves the right to change the terms and conditions at any time and in any manner regardless of the reason and without prior notification. All rights reserved. Any text, images, graphics, sound files, animation files, video files, and their arrangement on this site are subject to copyright and other intellectual property protection. These objects may not be copied for commercial use or distribution, nor may these objects be modified or reposted to other sites. This site may also contain images that are allowed for use by the provider but are subject to third party copyrights. The provider is in no way responsible for any off-website pages or any other websites linked to or from the site. The provider disclaims all responsibility for the accuracy of any of the information provided on such linked sites and any goods or services provided or purchased from such sites. The provider does not control or endorse the content of comments concerning individual products, posted by registered website users. The provider is not responsible for information in these comments and withdraws from any liability incurred by the information in these comments. Thank you for taking the time to share your thoughts with other L'OCCITANE customers.